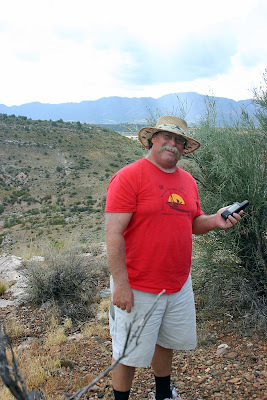 If you've never tried geocaching - check it out at Geocaching.com. All over the world there are caches of 'treasures' hidden for you to find. All you need is a handheld GPS and a desire to explore. 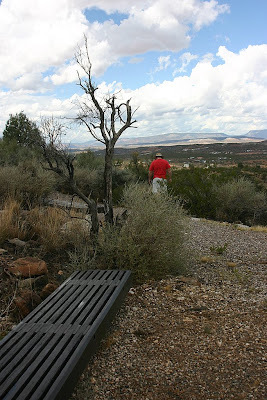 Here at the Thousand Trails park at Verde Valley, they've come up with their own geocaching game. There are 10 caches hidden around the park. They are rocks. 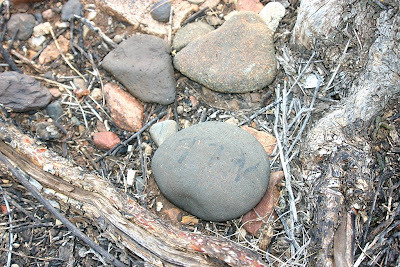 Yep, find a rock in a pile of rocks! Actually, they're pretty clearly marked with TTN on the top side. When you turn them over you see a number. Write down that number to prove that you found it. 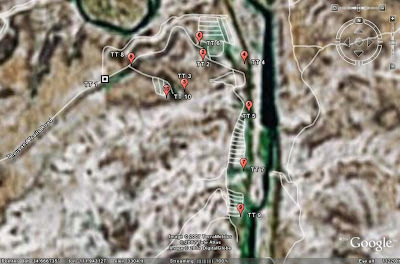 First, Jim entered all 10 GPS coordinates into Google Earth and printed out a map for us to follow: The best thing about geocaching is that it gets you to explore areas you wouldn't otherwise. Like this remote corner of the park with such a fabulous view. I wonder if all Thousand Trails are putting out geocaches? I think it's a great idea. And, the manager here was sure excited when we mentioned that we could cover 'how to geocache' in one of our computer seminars. He even says he can help us put together a tour of TT parks next summer for us to give our seminars. That would be just perfect!